India and France have signed a major co-operation pact which paves the way for the sale of French nuclear reactors to Delhi, officials say. The nuclear accord was agreed in Paris between Indian Prime Minister Manmohan Singh and President Nicolas Sarkozy. The deal "will form the basis for enlarged bilateral co-operation in the fields of energy and research", the French presidency said in a statement. France is a leading world exporter of civilian nuclear technology. The two leaders made no public comment after signing the deal. But a French presidential aide said that "today we are at the inter-governmental stage, and after that the industrialists will begin their co-operation". 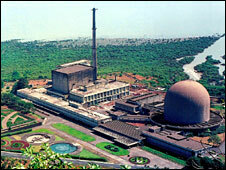 Tuesday's signing comes after India and France agreed a Framework Agreement for Civil Nuclear Co-operation in January. Reports say the deal includes providing India with France's latest model of the European Pressurised Reactor as well as other civilian nuclear material. Correspondents say that the deal is good news for India - which is desperately short of energy to fuel its booming economy - and places it firmly as a world nuclear power. The deal in effect ends a ban which prevented countries from engaging in civilian nuclear trade with Delhi. The ban was imposed in 1974 when India used its civilian programme to produce and successfully test an atomic bomb. France is the world's second largest producer of nuclear energy after the United States. It hopes to be at the forefront of an international revival of the industry which analysts say will benefit from worries about global warming and soaring energy prices. Russia is also eager to export nuclear technology to Delhi, after the 45-nation Nuclear Suppliers Group lifted a ban on India in early September. That, combined with the French deal and a proposed deal with the US, means that India is now in the international market for technology and nuclear reactors. 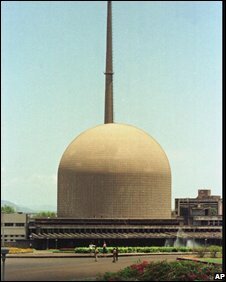 India has 22 nuclear reactors and is seeking to expand its nuclear energy sector, opening up a market estimated at 100bn euros ($142bn) over 15 years. The country - now seen as a strategic partner for both the European Union and the US - has a population of 1.1 billion and is tipped to be one of the future great powers of the 21st Century. But it gets only a tiny fraction of its electricity from nuclear power. Supporters of the deal say that more nuclear plants in India could help reduce global demand for oil and gas while at the same time significantly reducing the country's pollution levels. Tuesday's agreement was concluded days after the US House of Representatives passed a pact that would allow the US to provide nuclear materials to India. The upper house of the American Congress, the Senate, is expected to vote on the deal later this week. Critics of the deal say it creates a dangerous precedent by allowing India to expand its nuclear power industry without requiring it to sign the Non-Proliferation Treaty (NPT) as other nations must. President George W Bush has urged the Senate to "quickly" vote on the deal before it adjourns. Correspondents say he faces a race against time to sign the deal into law before he leaves office in January. It was first agreed three years ago and is regarded as a key foreign policy priority for both the Indian and US governments.